Here we were, outsider another hockey arena, trying to figure out what to do after our planned dinner destination didn’t pan out. It was not lost on me that I dug up and posted an old blog entry about this very topic, and how a last-minute change-up in dinner plans turned what should have been a fun night at a Capitals game into a disaster. Last night was the Devils’ last home game of the season, against the hated Rangers. We rarely go to weekday-night games, but with the kids on spring break and the desire to see the Devils one last time, we made plans to head to the arena an hour earlier than usual to eat at a barbecue spot that we knew had acceptable menu options for both kids. But when we arrived almost two hours before puck drop, the wait for a table was already an hour. There are a couple of other pregame spots near the arena in Newark. We tried one and found a similar wait. The other? It had gone out of business. It seems that the combination of a rivalry game, the Rangers having the opportunity to clinch the best record in the NHL, the Devils’ final home game, and lots of school districts on spring break, resulted in a lot of people at the arena district earlier than usual. So we stood outside the arena’s not-yet-open gates, wondering what to do. It was almost the exact scenario we found ourselves in a little more than five years ago outside Verizon Center. Ryan was annoyed — but just annoyed. Not agitated to the point of anxiety like he was then. We assured him of a worst-case scenario that was still acceptable: Entering the arena as soon as the gates opened and eating there. That was all we needed to hear. He led us up the stairs where we were seated right away. We didn’t even check the menu — another change from five years ago. Ryan’s palette has expanded so much that we can be reasonably certain he’ll find something acceptable to eat at just about any non-specialty restaurant. We ate our meal — burgers, fries, wings, salads — and had plenty of time to get to the arena for warmups. Instead of being completely derailed by a change in dining plans, it was barely a hiccup, and not mentioned again once we set foot in the building. A friend from work emailed to ask if we were at the game. I took yesterday off so we could go to the game early and he was wondering if that’s where we were. I told him yes, the whole family was at the game and that Ryan was bravely soldiering on after his Sharks were eliminated from the playoffs the night before. My friend knows all about Ryan, and his extreme version of hockey fandom. He mentioned how it was good night to make some memories with my son, and he ended his email with a reference to Ryan’s years-ago obsession with garage doors — the one that led me to take extreme measures to connect with him. 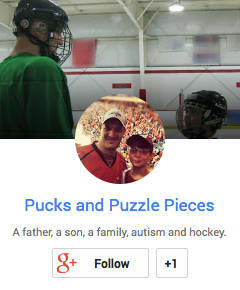 The one that, indirectly, led me to begin documenting our family’s autism journey. I thought about that as the night wore on. That was what, six years ago? Nearly half of Ryan’s life. Of course he has grown and changed plenty. But so have I. I’m pretty sure you could have knocked me over with a feather if you had told me on that day that we’d be at an NHL game, discussing the intricacies of the playoff races, having just eaten at an impromptu restaurant choice, all without incident. On that day six years ago I stood, sweating and bleeding and angry inside my garage, trying desperately to foster a connection with my son that, if I’m being honest, I wasn’t comfortable with. I hated that he was obsessed with garage doors. I didn’t find it cute or charming or quirky. I was upset that my son was different. Yes, it’s a heck of a lot easier to bond with Ryan over hockey than it was over garage doors. But I’d also like to think that I would handle the latter a lot better today. I’ve learned the fallacy of upholding “normal” as an aspirational goal. I’ve learned to appreciate him for who he is — just as he does. I still hate endings. I always have. But I did not cry as the Devils’ home season came to an end last night. Instead, I just enjoyed the time together as a family. I know that this is a bond — our shared love of hockey — that’s not ever going away. I know that we are better armed with the tools to understand our son and help him navigate his challenges. I know how awesome it feels to watch him blossom and develop, and to know that we can try things without fear that a hiccup in plans will cause a disaster. The Devils’ home season may be over, but there’s still two months of playoff hockey left. Ryan has announced he’ll join me in rooting for the Capitals this spring. I can’t wait to watch with him. I loved this post! I can so relate to the “then and now.” Our kids on the spectrum actually change us for the better. I’ve found that the more comfortable I am and accepting of my own child, the more he has actually grown and surprised us doing things we would have never imagined ten years ago. Thank you for reminding me to look back and forward to see the important progress!